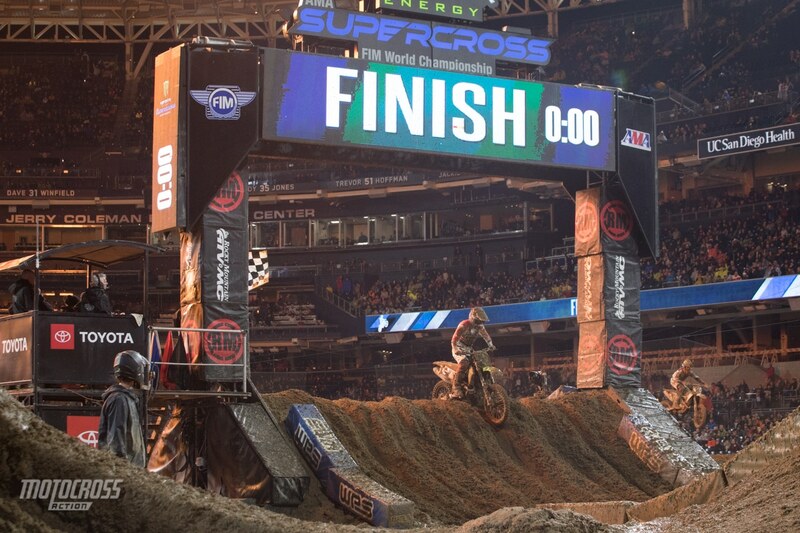 San Diego Supercross was pure carnage, Justin Barcia exited this corner with his eyes closed. Eli Tomac rolls the finish line as he takes his first win of the 2019 season in the 450 class. The conditions in San Diego were insanely tough. All week, the weather forecasted a monsoon on Saturday and everyone had plenty of time to get ready for it. The Dirt Wurx crew built the track early and prepared for rain by covering it with tarps. Although it didn’t start raining until the afternoon on Saturday, when it rained, it poured. AMA decided to adjust the qualifying schedule and eliminate free practice and first qualifying sessions to save the track. The rain came down hard and by the time the riders got out there for their one and only qualifying session, the track was a mudfest. 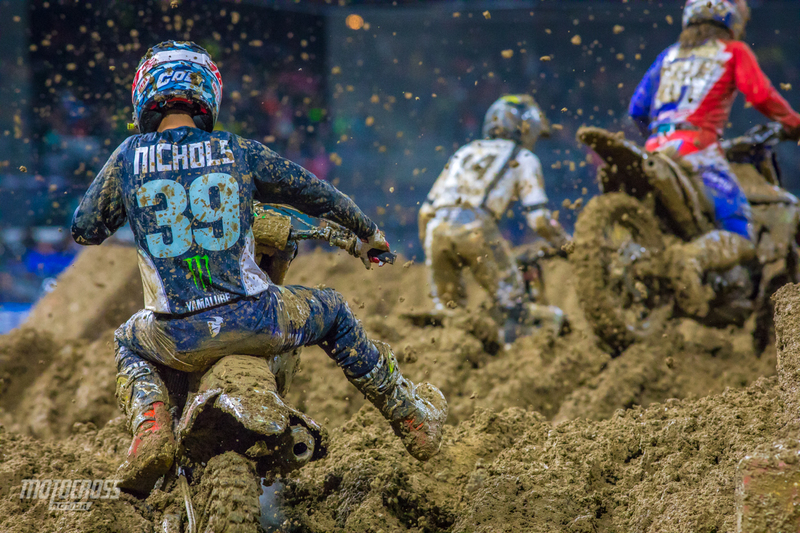 Because there weren’t any ruts underneath the mud and the track had a hard base, the riders were still able to launch a majority of the jumps. It was crazy. 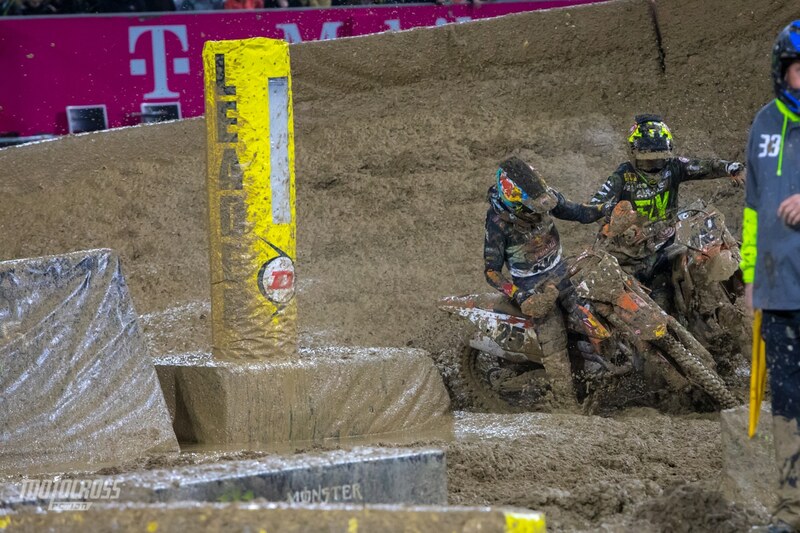 We were shocked when we saw the top guys clearing the triple and finish line in qualifying. Some of the riders were still jumping them in the heat races, but by the time the mains came around the ruts and bumps were deeper and there were a lot less guys risking it. 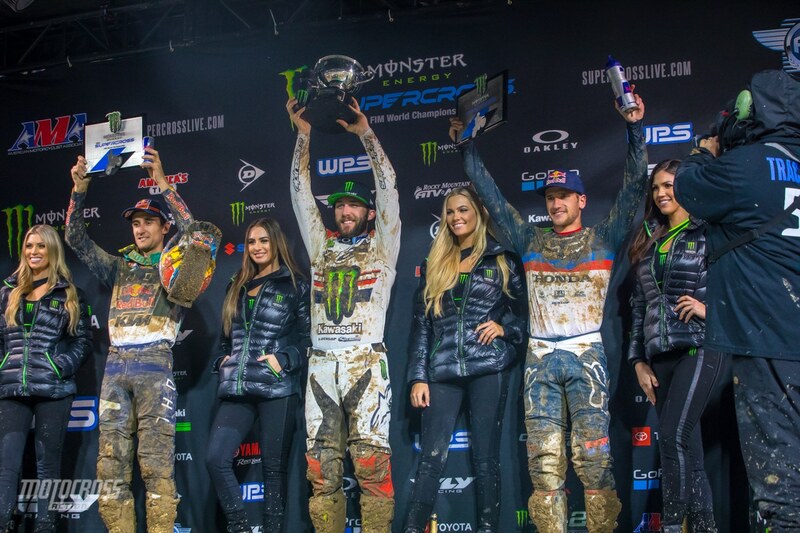 One of the top stories after San Diego Supercross has been about the lime in the dirt. 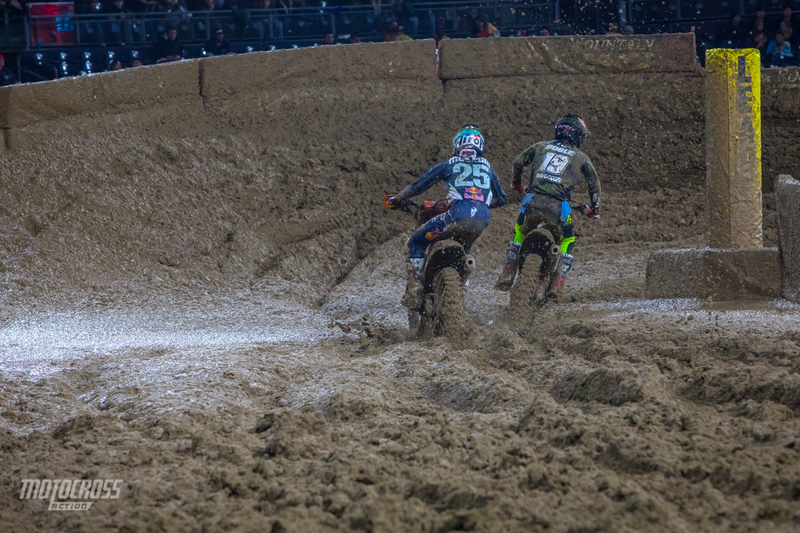 When it rains, the Dirt Wurx crew usually adds lime to the track in order to absorb the moisture in the dirt. Construction workers will add lime to the dirt on their job site if they know it’s going to rain but they want to continue working. 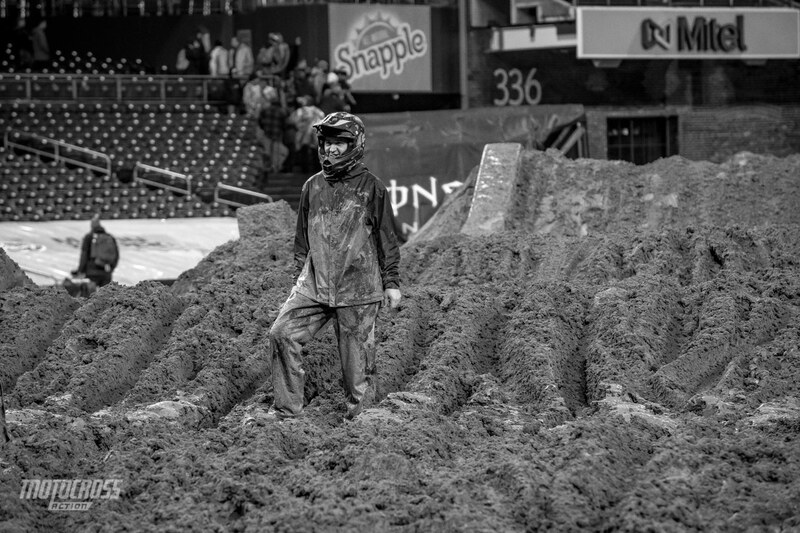 At Supercross, the lime is used to absorb the moisture out in hopes of making a better race track and a lot of times it works. There have been many occasions where a track receives rain and we think it’s going to be a mud race, but the Dirt Wurx crew is able to save the track by covering it with tarps and then and using lime. This time there was too much water and the lime didn’t help. And now we are seeing that the chemical has a negative affect on the riders and the bikes. 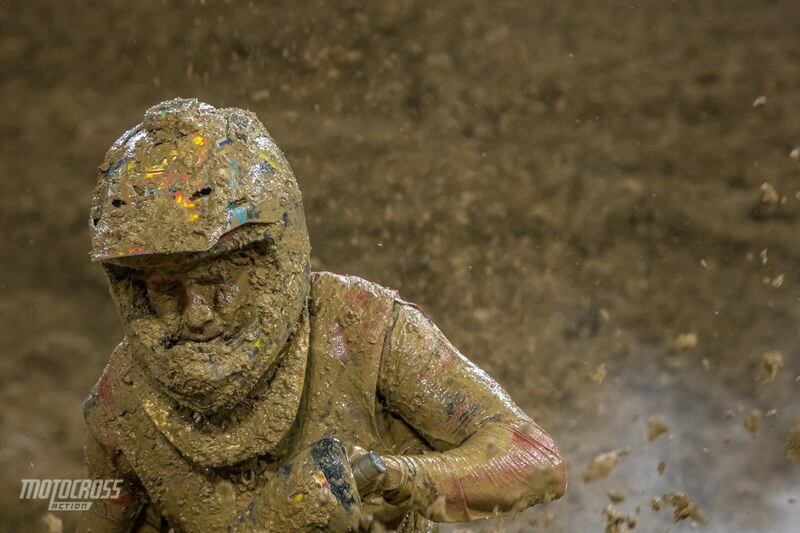 Because of how muddy it was, every rider was covered. Now many top factory riders, privateers and mechanics have been posting on social media about the chemical burns they have on their skin and about the damage it has done to their bikes. The 250 main event start, we’re thinking the riders might have been better off using jet skis! San Diego marked the halfway point for the 250 West division. 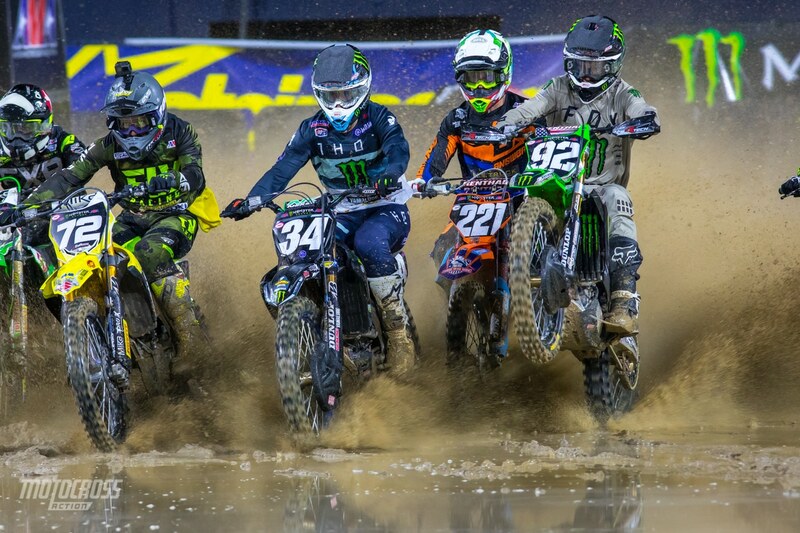 Now these riders have three weekends off before they join the series again in Atlanta for the 250 East/West shootout. 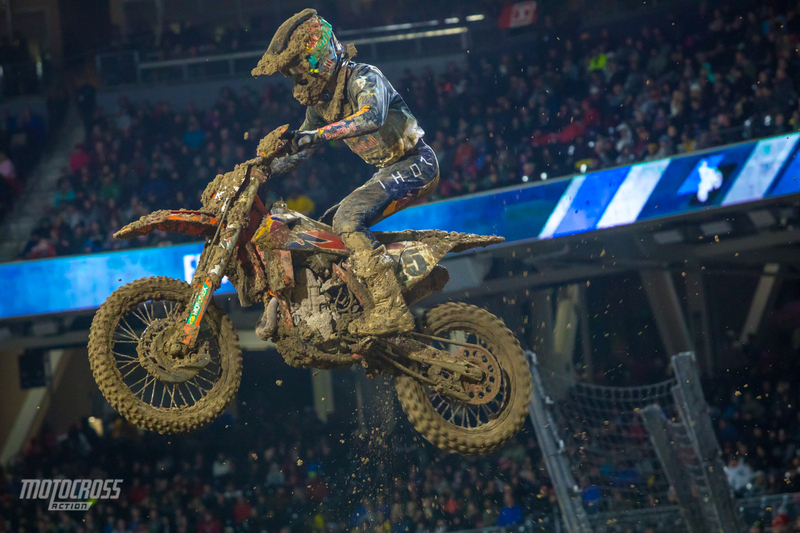 To add to the excitement of the 2019 season, the 250 East riders will be joining the series for their first round next weekend in Minneapolis. 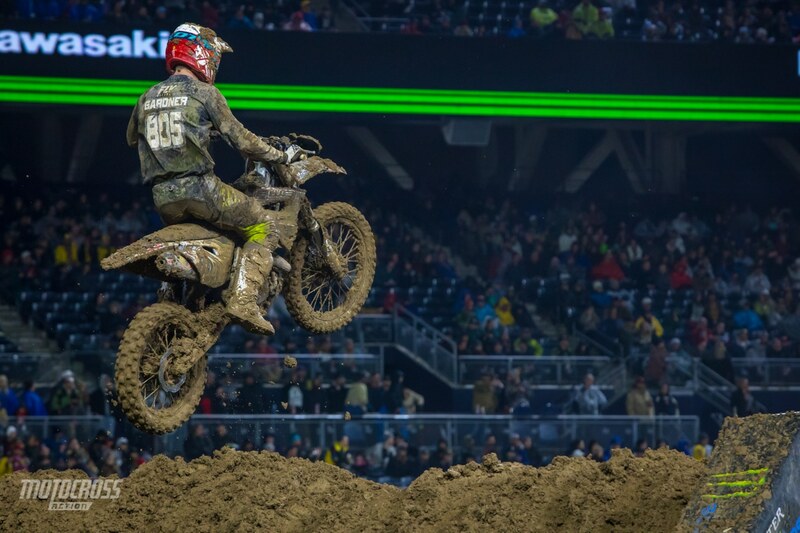 We also will have Zach Osborne joining the 450 class in Minneapolis for his first 450 Supercross race in America. 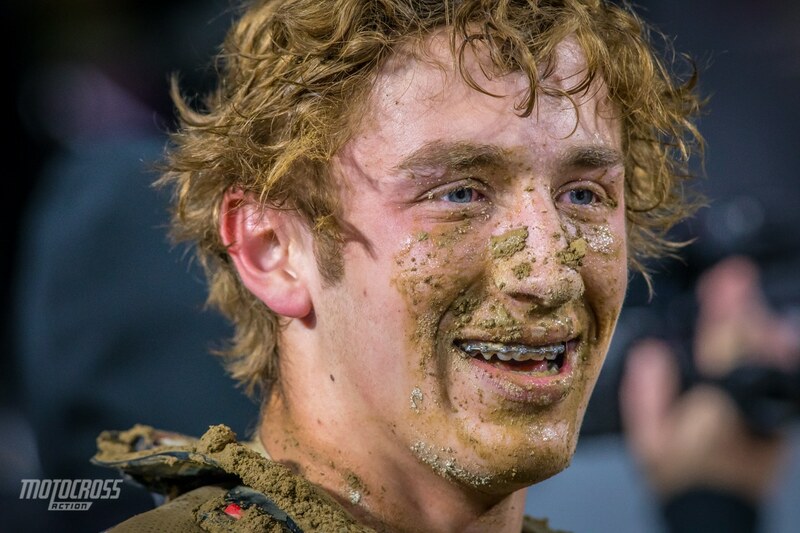 After his Anaheim 1 win in the mud, we had high hopes for Justin Barcia in San Diego and he was riding well. 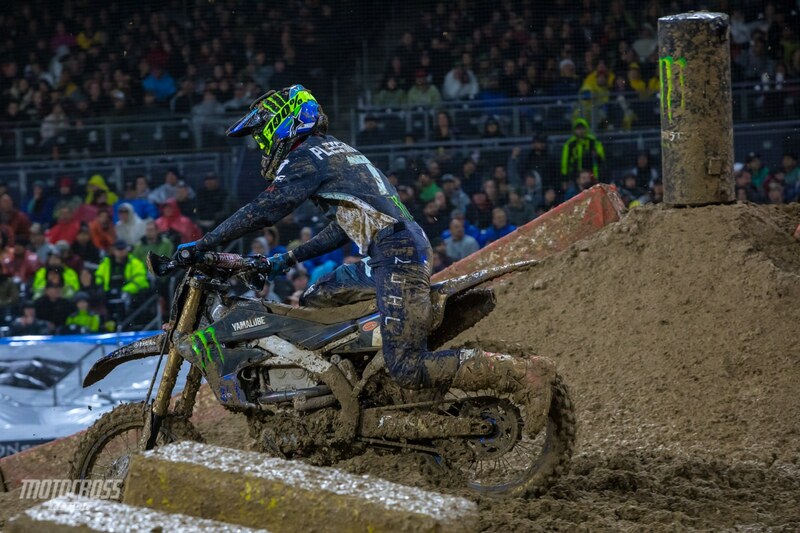 The Yamaha rider qualified sixth, placed fourth in his heat race and he ran third place in the main event until his bike quit on him on the third lap which resulted in a DNF. 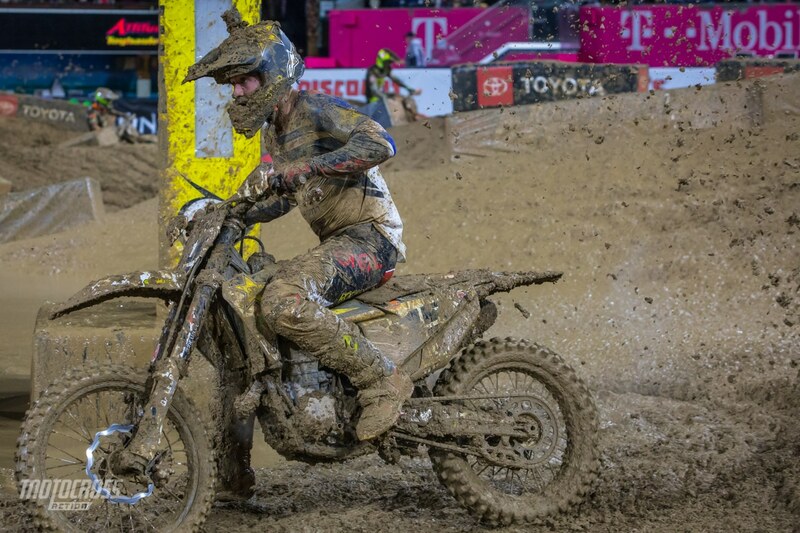 Justin Bogle is one rider who seemed to accelerate in the mud. 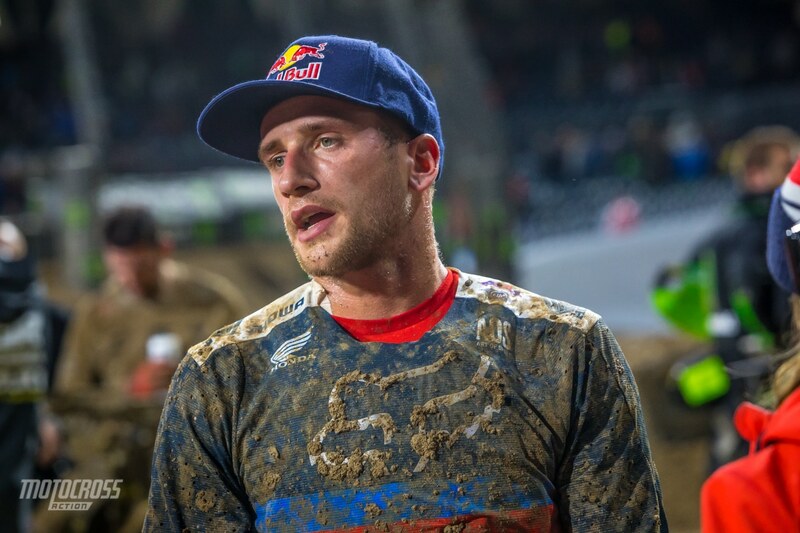 With only days on the KTM before Anaheim 1, Bogle was behind the 8-ball when the 2019 season started. 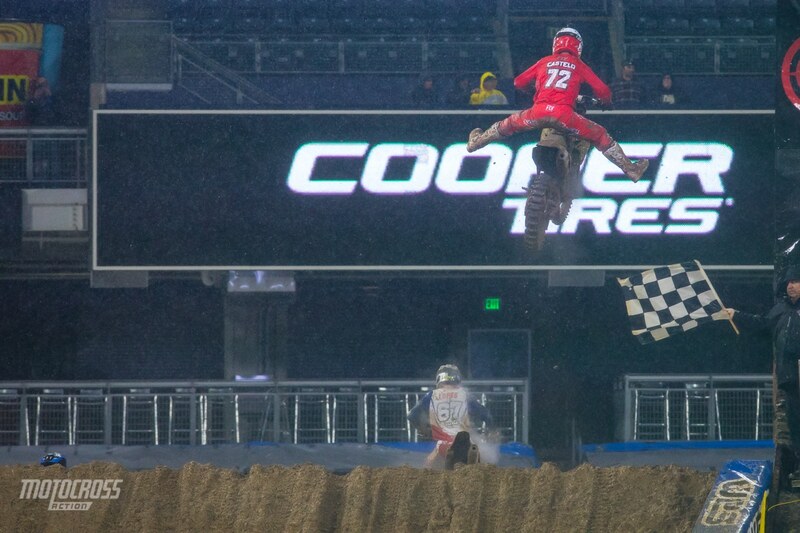 However, in San Diego the rider from Oklahoma was set out to take advantage of the wild card conditions. 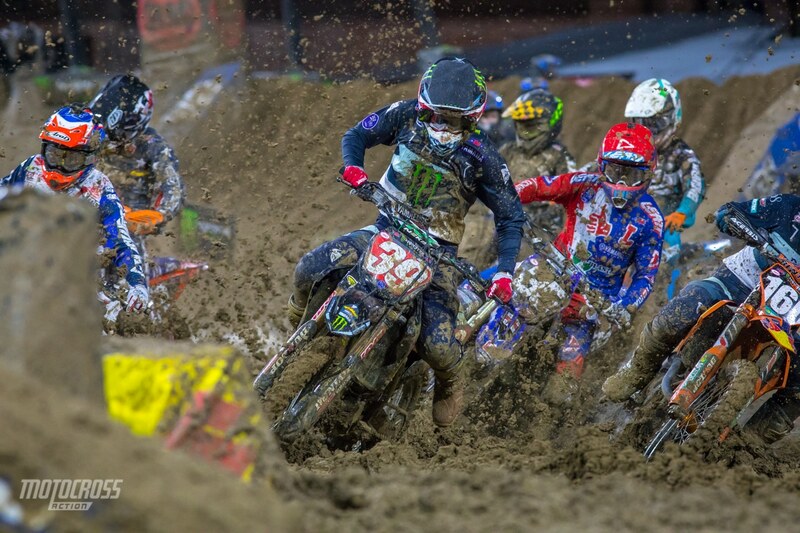 Bogle ran second for over half of the 450 main event and after Roczen and Musquin passed him, he finished fourth. Chad Reed has now made 18 starts in San Diego and won it six times (2003-2005, 2007-2008, & 2011). With his fifth place finish on Saturday he has 11 podiums, 14 top fives, and 16 top-10 finishes in those 18 starts. 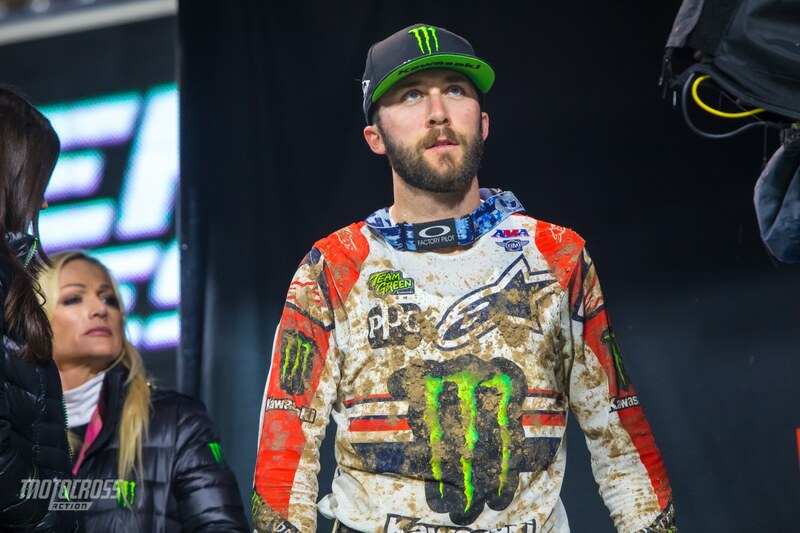 After the first four rounds Eli Tomac didn’t look like the same guy that we were used to. He has played it smart and it seems like he’s been content to finish on the podium or even in the top five. 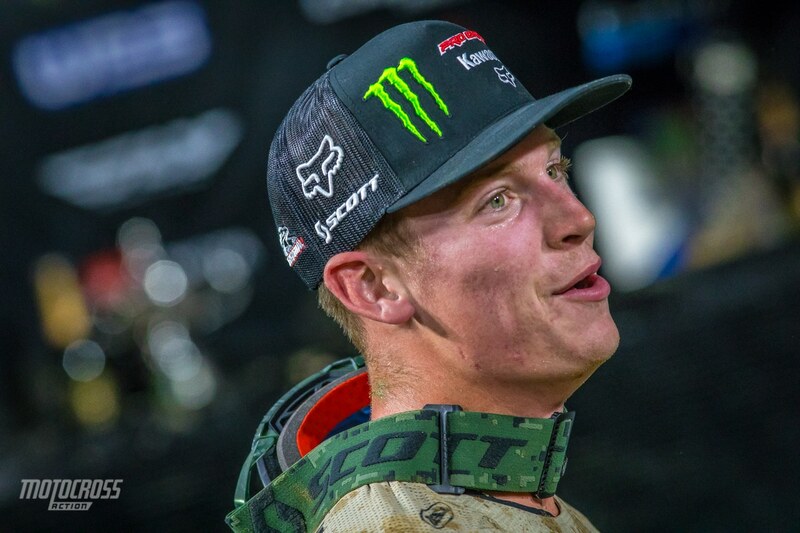 We expected Tomac, Musquin and Roczen to be battling for wins at the first few rounds, but it wasn’t until round five when Tomac earned his first win of the year. The other two are still looking for the top spot. But their strategies seem to have worked out for the three of them. Tomac is now in the points lead and Marvin and Ken are close behind. 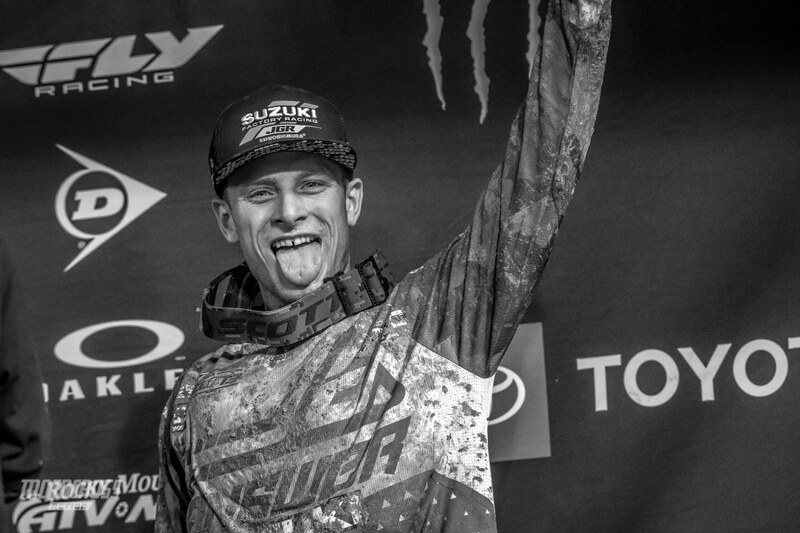 Shane McElrath salvaged some major points in San Diego. A thirteenth in the heat race forced Shane to go to the LCQ where he finished second. This gave him the twentieth gate pick for the main event. 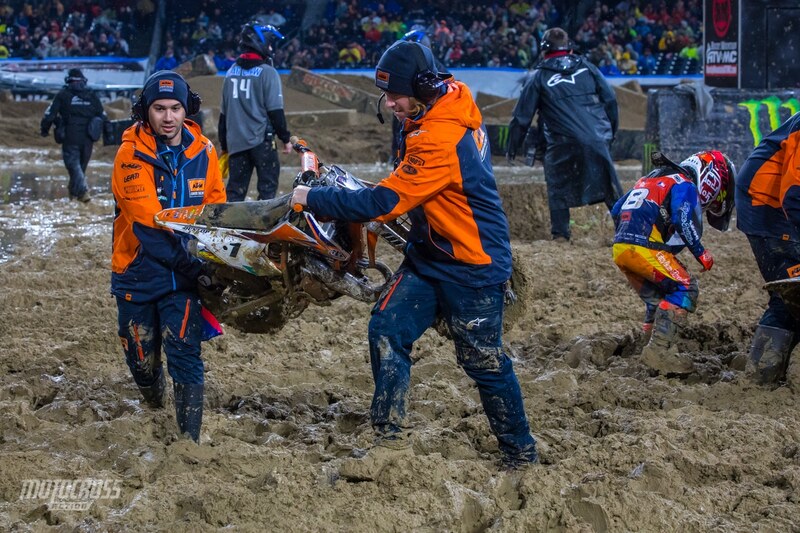 In the main, the KTM rider went down and picked his bike up in last place. 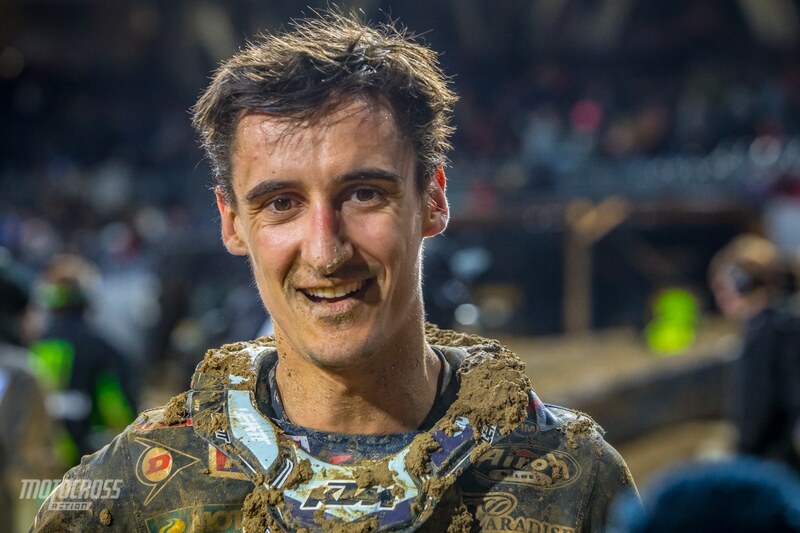 Shane crossed the finish line in nineteenth on the first lap and charged through the pack to end the race fourth earning nineteen points and keep his title hopes alive. 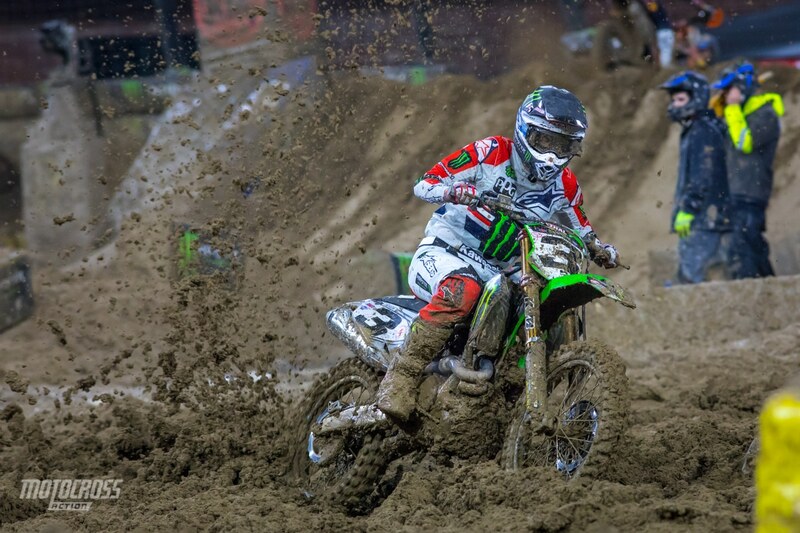 Adam Cianciarulo wheelies his way through the puddles, that’s one way to stay clean. Adam finished second in his heat race and first in the main. Dylan Ferrandis leans back through the rolling whoop section. 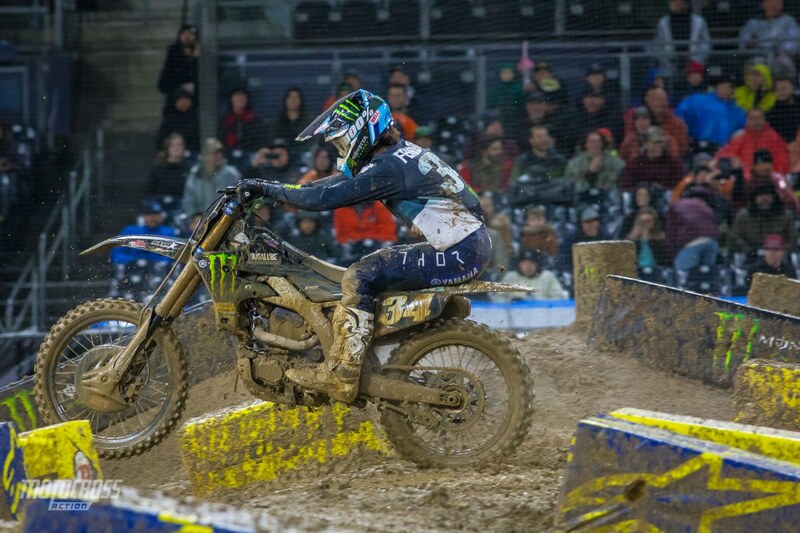 Dylan had a rough go in San Diego, the Yamaha rider was in third with only one corner left when his bike quit on him before he could cross the finish line. Luckily for Ferrandis, Adam lapped up to seventh place. 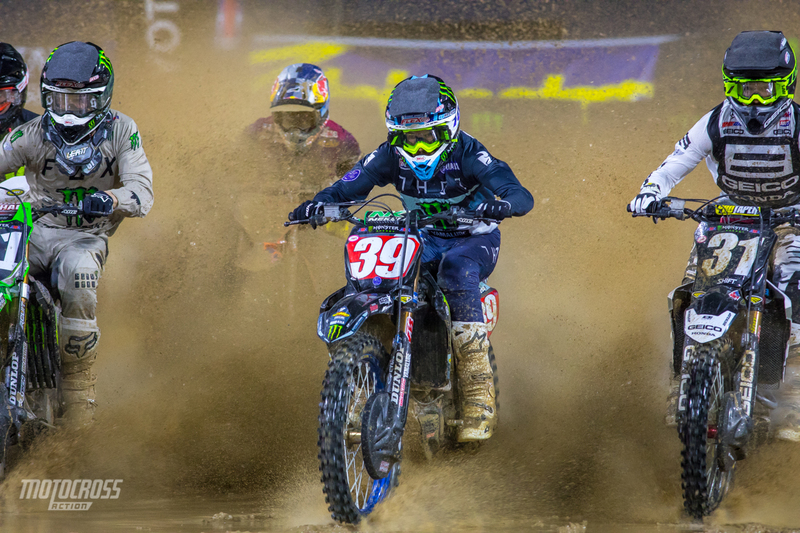 Dylan was only passed by four riders which gave him seventh place in the 250 main. 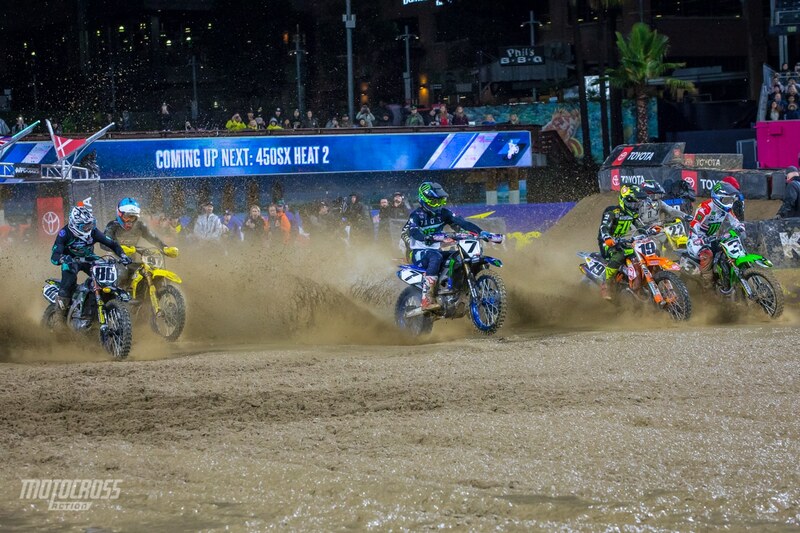 Colt Nichols won the opening round of 2019 and he held the points lead in the 250 class up until San Diego, but a tenth place finish in the mud would drop the Yamaha rider to third in the championship. 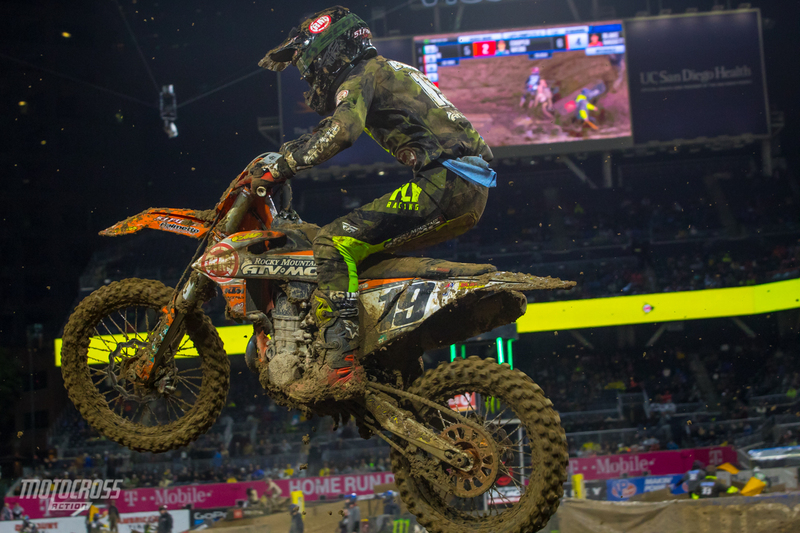 Adam Cianciarulo took advantage of the tough conditions and grabbed an eight point lead over Shane McElrath in the 250 Championship standings. Colt Nichols had a rough go in San Diego, he was running in eighth at the beginning of the main event and a crash on lap five put the points leader in fifteenth. He passed a few riders but would only make it back to tenth. Jess Pettis has continued to impress in 2019. 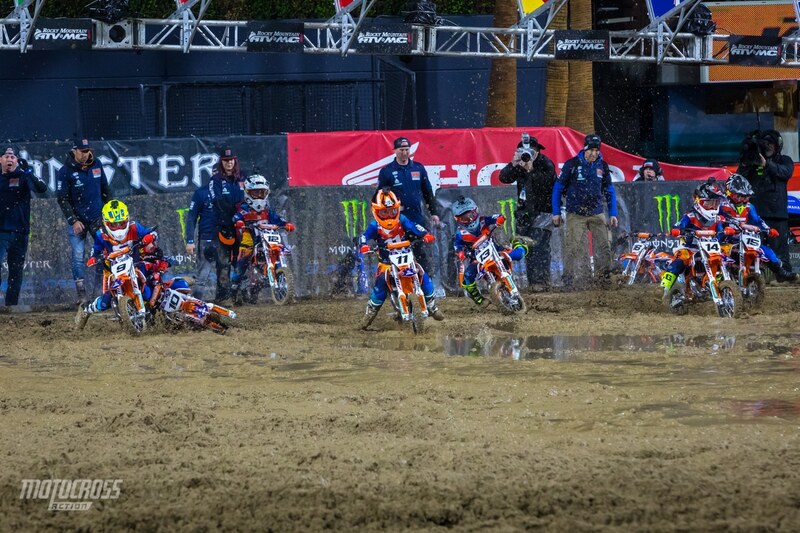 At San Diego the Red Bull KTM 250 rider from Canada almost grabbed the holeshot and he stayed at the front of the pack to finish fifth place in the 250 main event. 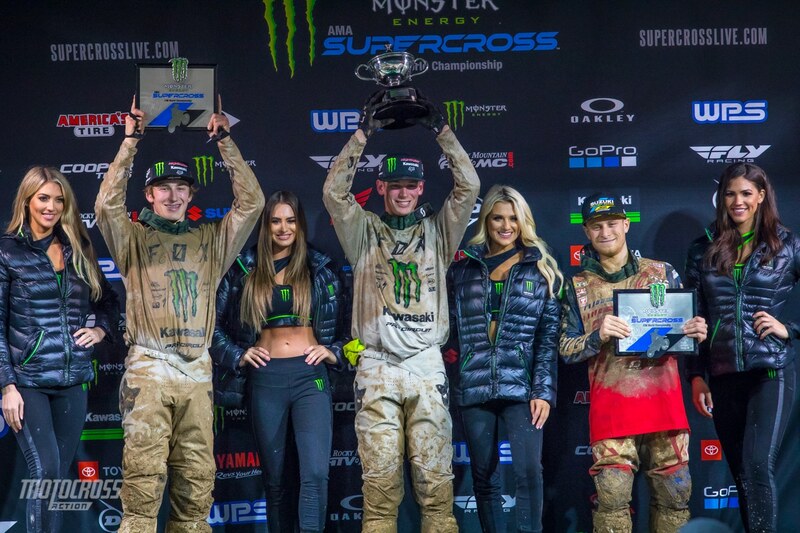 Adam Cianciarulo won the 250 main event by eight seconds over his teammate Garrett Marchbanks and thirty-five seconds over third place Jimmy Decotis. 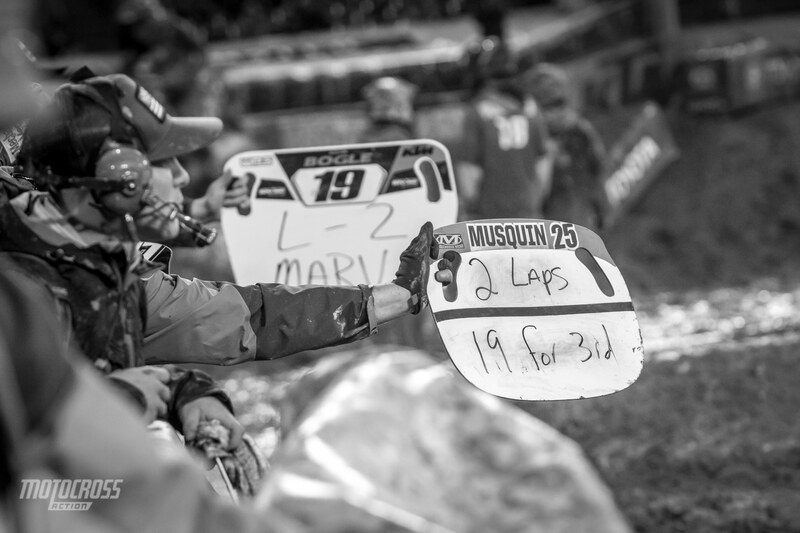 Pit board battles between Marvin Musquin and Justin Bogles mechanics. 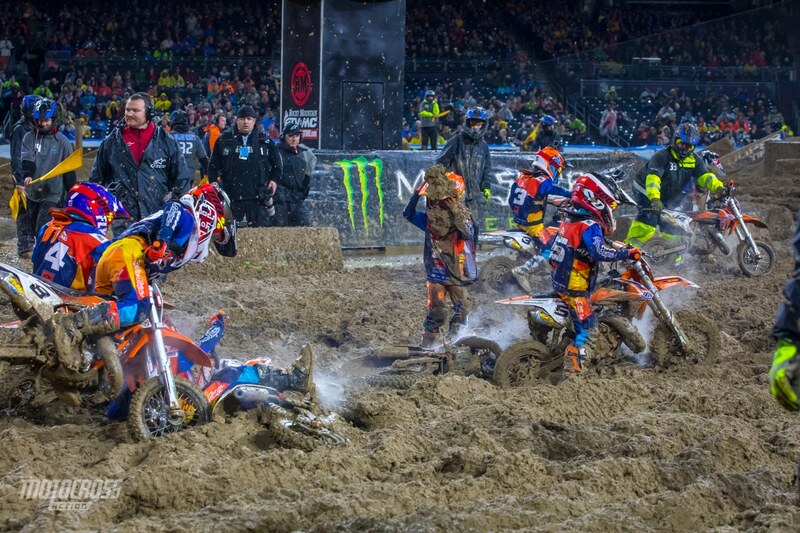 Things got close between the Red Bull Factory KTM and Rocky Mountain ATV-MC WPS KTM. 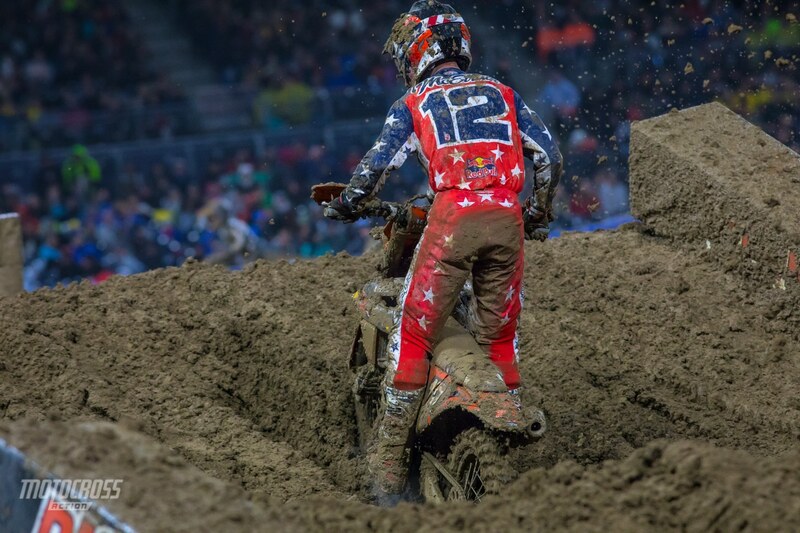 Marvin Musquin eventually pushed his way passed Justin Bogle with a lap and a half to go. Colt Nichols in survival mode getting though the rhythm section. 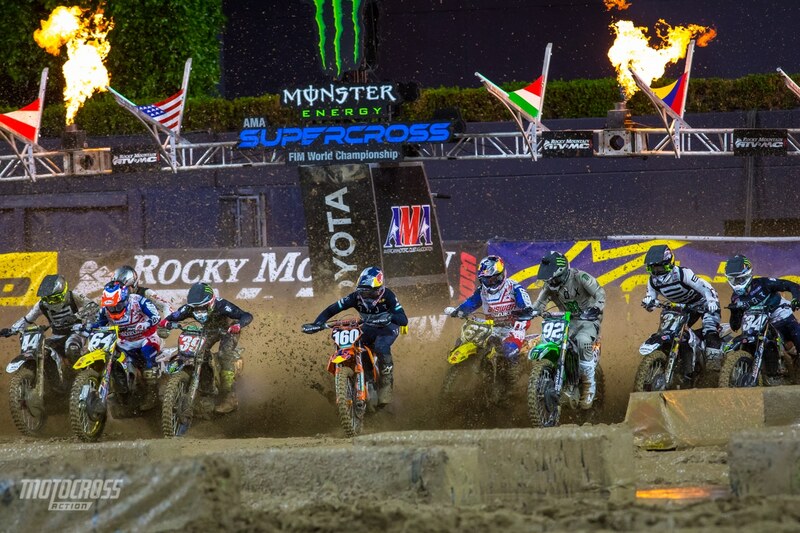 The BarX Suzuki rider from Ecuador, Martin Castelo had a career best sixth place finish in San Diego. 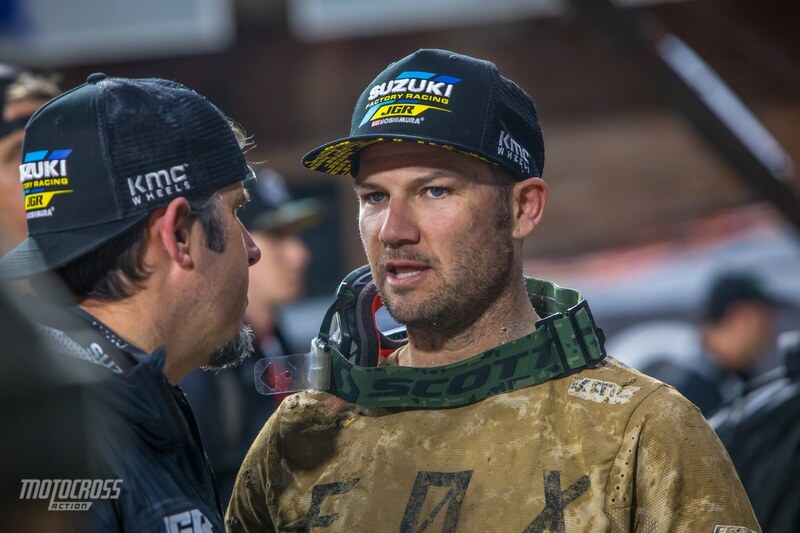 Martin’s deal with the BarX team was only to race the first five rounds of Supercross and now he is searching for another ride to finish out the season. 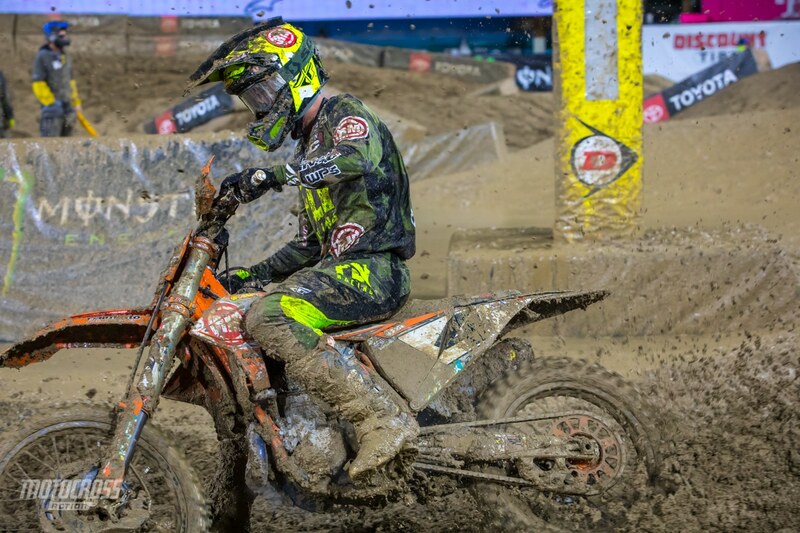 Blake Baggett finished fifth in the heat race and ninth in the main event, he now sits fifth in the Championship point standings. The start was extra important in San Diego. 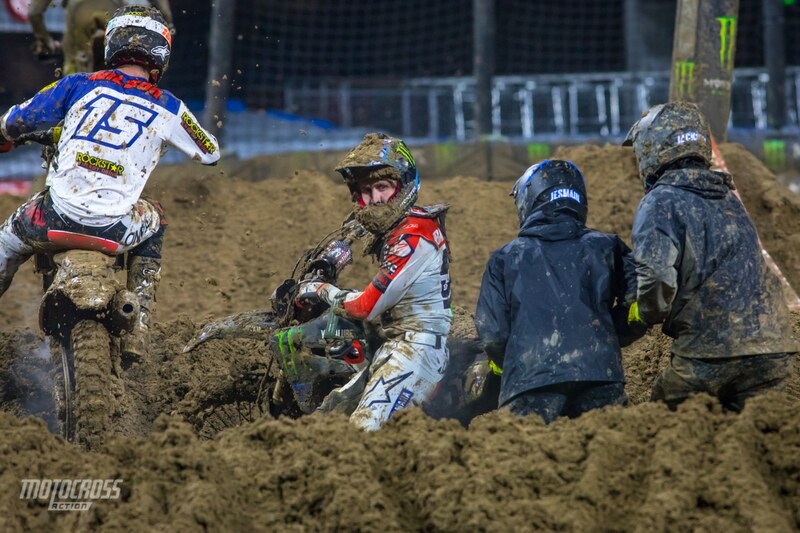 If you weren’t out front your goggles were covered in mud right away. 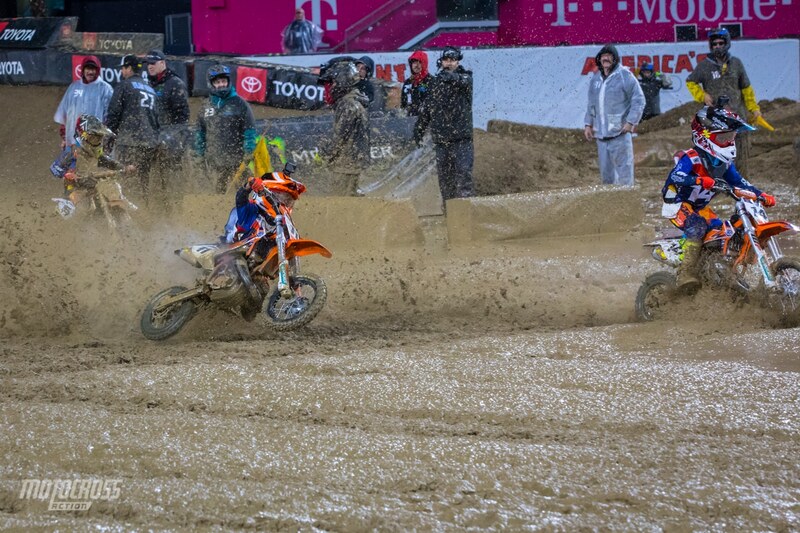 The track in San Diego was biting riders left and right. 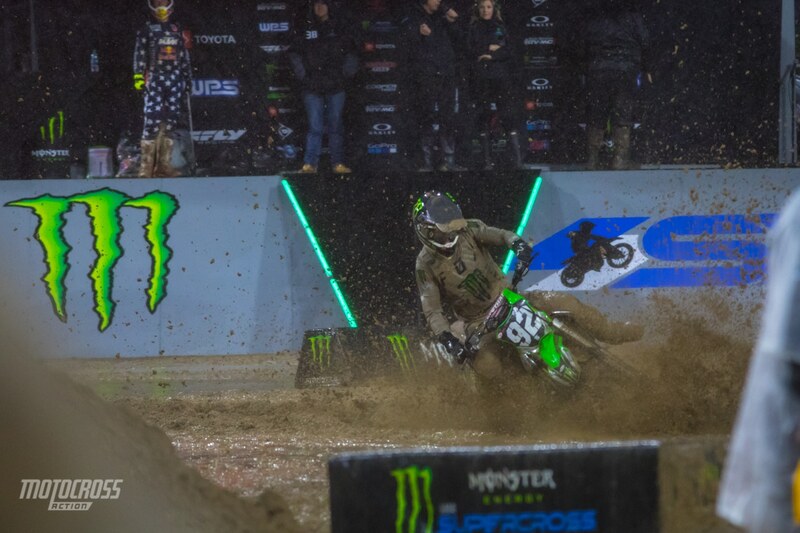 Here Adam Cianciarulo goes down while on a flat straight away in qualifying. 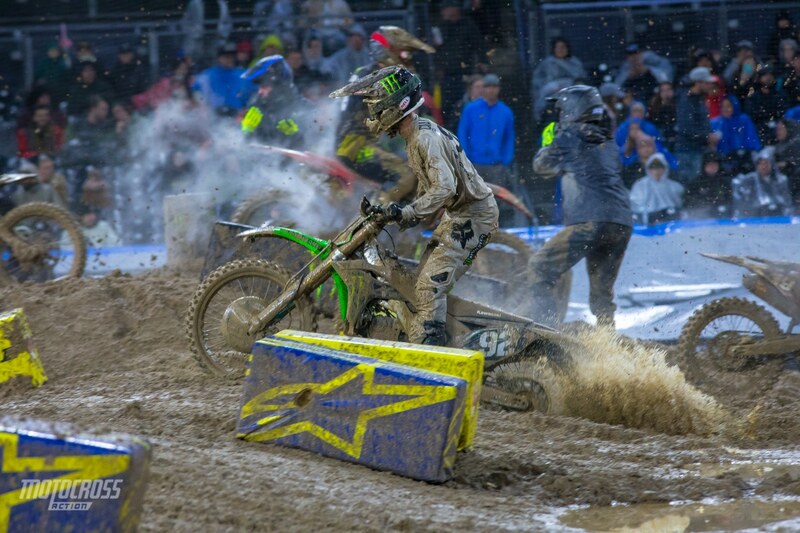 Aaron Plessinger is known for being good in the mud and he finished sixth in San Diego. 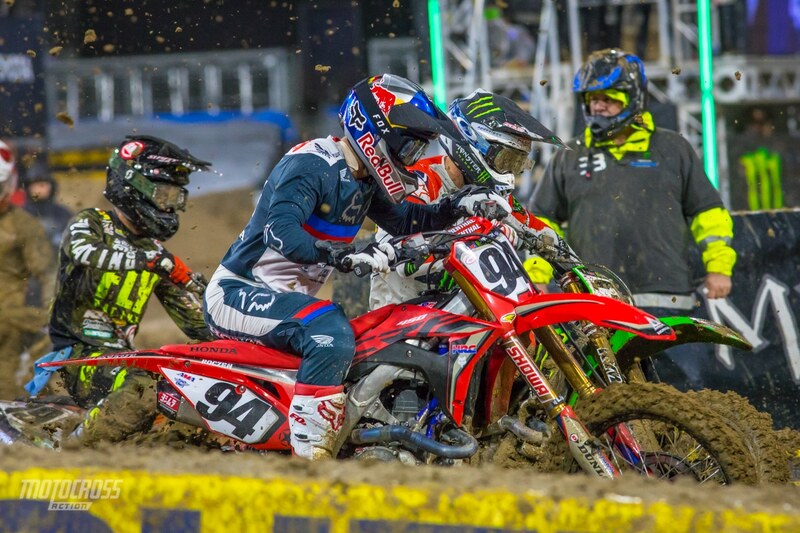 Carlen Gardner made his third 450 main event of the year and finished sixteenth on his BWR Honda. We were surprised to see the KTM Junior Challenge 50 riders attempt to race, it did not go very well and the best 50 riders only made it to the third corner before the whole class was stuck and they red called the race. The number eleven lost control going down the start straightaway. The mud was gnarly for the little guys! Most of the class didn’t make it to the first turn. The KTM guys definitely got a good workout in San Diego!